Hey San Diegoans: looking for something to do this weekend? Why not go get some BBQ, get tattooed and help out with a completely worthwhile cause? A local woman’s softball team in the America’s Finest City Softball League (AFCSL) is holding a fundraiser this weekend, with the help of local tattoo shop, On Point Tattoo. One of On Point Tattoo’s artists, Nicole (Coco) Boyce, doubles as a member of The Square Shooters women’s softball team. The team is attempting to raise money to help teammate and friend Christynn Holt deal with the enormous medical bills as a result of her ovarian cancer. In addition to struggling to raise the necessary funds for Christynn’s medical bills, the team is also trying to raise enough money to enter the Sweet Madness tournament; a charitable tournament whose theme this year is “Homerun for Christynn”. All proceeds from the tournament will also go to helping Christynn in her fight against cancer. Now that you know all the details, why not head over to On Point Tattoo this weekend (1020 Grand Ave. in Pacific Beach), and chose from the four different ribbons that will be on sale for as cheap as $30 per tattoo? 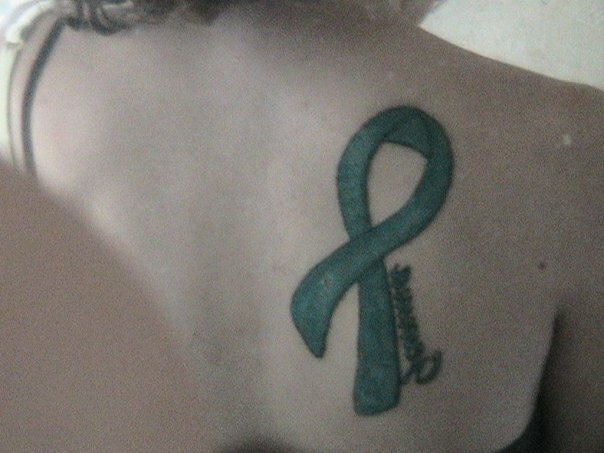 There is a standard teal ribbon, which the Shooters have been wearing on their uniforms as a reminder of Christynn, their teammate who can no longer play. Then there is a single pink ribbon for breast cancer. You can also get one with both ribbons intertwined($50), and finally one that is a camouflage design, using both the teal and pink ribbons. The proceeds from this will go to Christynn and the girls (which ultimately goes back to Christynn). Maybe you’ve got a relative or a friend or a loved one of some type who passed away from cancer. If you’re in San Diego and you’ve got the money and the skin, it can be a great way to honour/remember that certain person, as well as lending a hand with a worthwhile cause.